In Turin in 1889, Nietzsche flings his arms around an exhausted carriage horse then looses consciousness and his mind. Somewhere in the countryside: a farmer, his daughter, a cart and the old horse. Outside, a windstorm rises. The self-declared last film of renowned Hungarian filmmaker Béla Tarr (Satantango, Werckmeister Harmonies), The Turin Horse seeks to capture the rhythm of life in real time and to raise a sharp awareness of the moment. Winner of the Silver Bear at the 2011 Berlin Film Festival, The Turin Horse has been a big hit with critics, being described by Empire as "an intimate epic of grim, formal beauty and disconcerting foreboding," Total Film as "an intoxicating vision of life at the end of its tether," and The Guardian as "utterly distinctive: a vision of a world going inexorably into a final darkness." 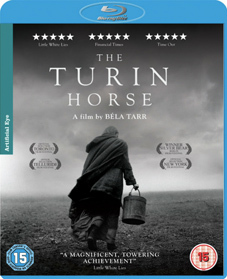 The Turin Horse will be released on UK DVD and Blu-ray on 10th September 2012 by Artificial Eye at the RRP of £15.99 for the DVD and £19.99 for the Blu-ray. Extra features have yet to be confirmed. Since it's out in a week, we shouldn't have to wait long to find out.